Everyone's a critic -- especially if you're a polarizing former president who now exhibits oil paintings. 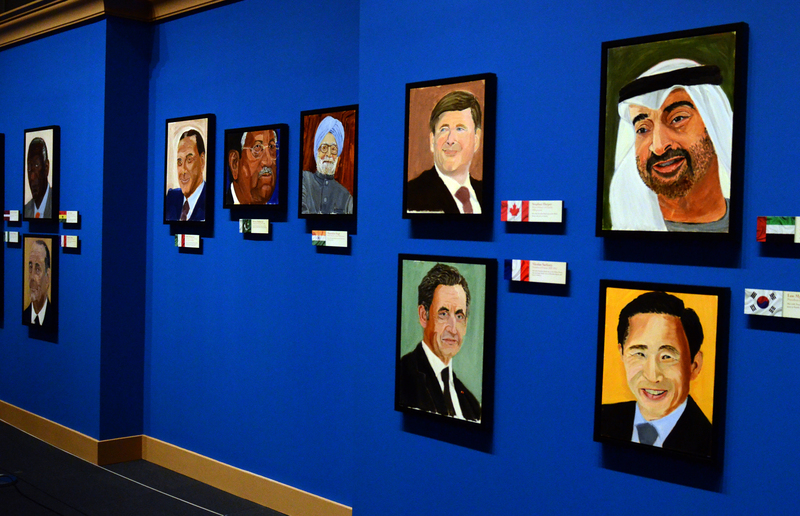 Reaction is pouring in on former President George W. Bush's portraits of world leaders, unveiled this week in a gallery show at Mr. Bush's presidential library in Dallas. And thus far, the reviews are mixed. "They are not bad so much as cautious, vacant, even servile -- paintings by an artist anxious, or perhaps incapable, of doing anything that might leave a mark," scoffed the Guardian's Jason Farago, who seemed offended that Mr. Bush hadn't offered some unique insight into the leaders he painted. "It is futile to gaze at these paintings and discover anything of importance about Bush's foreign policy, or even much about Bush's post-retirement life," Farago wrote. "Or if they do, they say only this: both the painting and the policy reflect a man untroubled by outside judgment, certain beyond any doubt of his rectitude and self-worth." The Telegraph's Alistair Cooke observed that "Bush paints in a similar fashion to the way he talks - affecting a folksy, homespun, plain-speaking tone, with just enough ham-fisted strangeness and bungling missteps to keep things interesting." Several critics were particularly drawn to Mr. Bush's painting of Russian President Vladimir Putin, speculating on what it might say about the relationship between the two men. Cooke said there was something "unconventional and compelling" about the painting of Putin. "Far from flattering the Russian autocrat," he wrote, "it suggests a strained, potentially bruising relationship between sitter and artist." "The painting of Putin doesn't necessarily stand out because of artistic merit (though I'd argue that it is a really good painting aesthetically)," wrote the Washington Post's Adam Taylor. "What's really fascinating is to watch Bush grapple with the identity of Putin, a man he once claimed to understand well." After meeting Putin for the first time in 2001, Mr. Bush famously said he'd "looked the man in the eye," was able to "get a sense of his soul," and found him to be "trustworthy." Some critics struggled to separate Mr. Bush the artist from Mr. Bush the president. "The paintings are kind of primitive and amateurish, which is kind of how I remember him as president," New York-based artist Paul Chan told the New York Times. Others offered a more charitable appraisal of Mr. Bush's work. "Okay, I'll say it: I really like George W. Bush's paintings. They're sort of edgy," tweeted the Washington Post's Karen Tumulty on Friday. And while President Obama hasn't personally weighed in on Mr. Bush's artistic pursuits, he's a big fan, at least according to an aide. "I've heard President Obama speak about President Bush's works in a very complimentary fashion," said White House spokesman Josh Earnest on Friday. "I think that's been the reaction from a lot of people that I have seen -- that people have been impressed...both at his natural ability but also at the way that he has pursued an interest that I think a lot of people didn't expect him to have."